The Ashley hears that MTV is trying every trick in the book to get Kail Lowry‘s mystery baby daddy to appear on the upcoming season of Teen Mom 2, but so far, nothing has worked. The Ashley can exclusively confirm that the father of Kail’s third child has so far refused to sign a release form for the show, which means that MTV can’t show his face or use his name on any episode. The show’s producers are doing everything they can to get “Mystery Man” to agree to appear before time runs out! 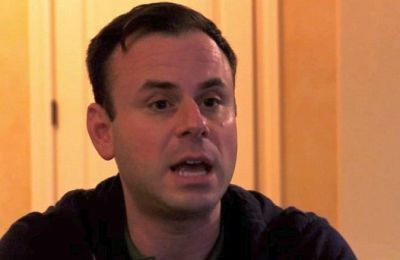 The crew member says that Kail’s crew has had to shoot around “Mystery Man” as much as possible, but it hasn’t been easy. Because of this, the show’s producers are trying to convince him to appear. So far, he’s has refused the money. Because of this, the producers have their hands tied. From what The Ashley hears, Kail’s hoping that “Mystery Man” signs on to appear, because it will put an end to the speculation as to who the father of the baby is. 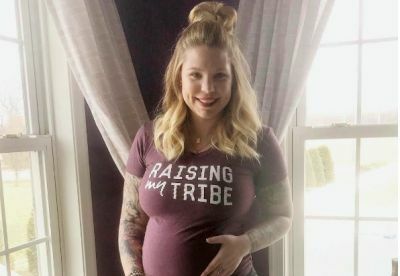 The Ashley’s source assures her that none of those men are the father of Kail’s baby, and that Kail definitely knows who the dad is. “If [the dad] gives her the OK, she’ll reveal it, but she’s keeping quiet until he feels comfortable going public,” the source added. This will be Kail’s third child. She already has son Lincoln with her ex-husband Javi Marroquin, and son Isaac with her ex Jo Rivera. 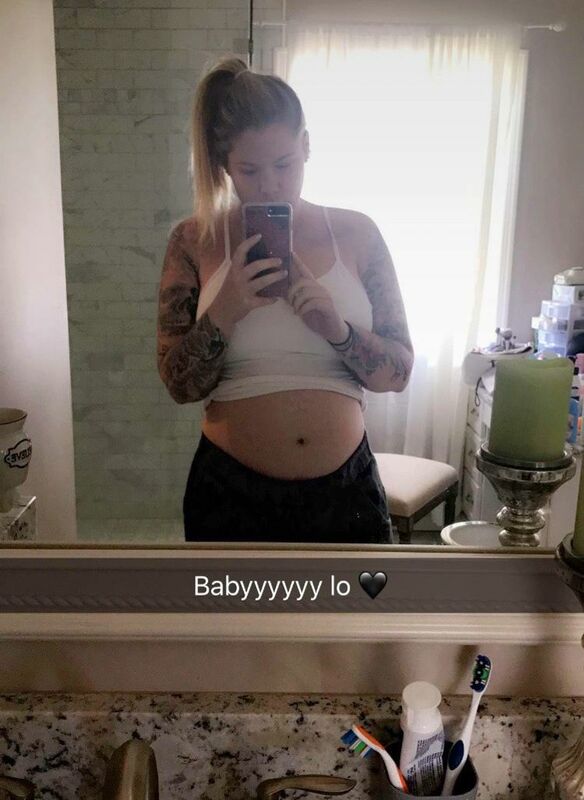 Yesterday, Kail captioned a Snapchat photo of her baby belly with the words “Babyyyy Lo.” This caused some fans to speculate that Kail was confirming that rumored baby-daddy Chris Lopez is indeed the baby’s father. She has yet to actually confirm anyone as the father, though. Is he embarrassed? No, really. Is he? I honestly believe it was that black guy in that one episode. & to be honest i think they are loving the attention and hype around this scandal. For all we know, MTV could have already convinced him to film, and they are making it seem like he doesn’t want to, just to cause even MORE hype and make people anticipate next season even MORE. This is the only real exciting/ drama filled thing going on in the show lately. The previews are gonna be based all around this situation i bet. My sister in law lives in Dover and works at a salon. She says they just hired Vee to work as their receptionist. Hope I get some intel haha! So glad to hear that Vee is normal. The more we’ve seen of her, the more I’ve liked her. She’s actually sane, unlike so many of these moms. I’m really disgusted with Kail at this point. Looking at her makes me cringe. I think he was on the episode where Javi shows up(and freaks out) and there is a guy there right after they split. When Jo is picking up Isaac there is a really tall skinny black guy with dreads standing in the driveway and I think says what’s up to him. His back was to the camera but he does kind of match the description of Chris Lopez and it was about that time she got pregnant. But, based on the pics of him and the name he looks Puerto Rican. Which would make sense she has always had a thing for Puerto Rican guys. These girls are just all so disgusting that I can’t even watch. Children, real live little people, are the result of all these poor choices. What about them??? No dad in the home, not their dad, anyway, and mom is always onto the next lay?? Kail doesn’t love her kids. She doesn’t love anyone, not even herself. I agree with most of what you said but I feel that Kail does indeed love herself. Why else would she get plastic surgery and think she could be a tv show host with those flappy jowls, the clap, and trash goblin tattoo sleeve? In the end it is (like you said) a pretty unrealistic depiction of single or co-parenting life at that age. Most folks don’t have several vehicles, a $400,000 house, and parents to financially support. Although he’s smart to not want to be seen….especially fresh off the heals off the Javi drama….he must not be that intelligent if he thought it was a good idea to procreate with Kail….Everyone knows Kail is a man eater, and a life ruiner, and now he’s stuck with that that tornado for the next 18 years. Yeah, but she had “fertility issues”, remember? Hence, why he referred to is as a miracle baby. She probably convinced him that she couldn’t get pregnant again. Lol! These girls are making it more and more difficult to film them. The struggle is not worth the money. Cut them all loose. As much as she’s talkin bout “black soul” stuff…you know that baby will be black. Let’s see how long this guy will stick around… Bet they’re in court by the end of the year! what kind of custody/visitation arrangement can you have for a newborn? how does that work. this is nothing short of a clusterf*ck. given her history of failed relationships, why would this one be any different? yeah that whole black soul, black heart, i love all things black spiel seemed like she was trying real hard. it was a little uncomfortable to watch…in my head i was saying…stop it, just stop talking. This guy is smart. He knows he will receive a huge backlash if he shows his face because he slept with a recent divorcee and knocked her up. I mean, she could have double crossed him (I think Kail is capable of lying she is on birth control when she isn’t) but I kinda doubt that because she is saying it was their decision to make this baby. So yeah, he is something else to just go along with it. Having children is not just a snap decision, it takes serious consideration if you’re capable of bringing another child into this world. (Yeah, I know people have “oopsie babies” all the time but that was not the case here). And if it is really this Chris dude, people already know who he is and he won’t have privacy after all. I think Chris needs to get a DNA test before he acknowledges this third one. She’s been with everyone including some women. Gurl is a giant ho. Is she ashamed of the father? Seems like more attention seeking to me. It’s that black guy that’s putting something in or out of the trunk of a car in the recent episode where Jo comes to get Isaac. They don’t show his face but that’s definitely him. I forget his name. I was hoping it was that producer they keep showing with her lately – just for the scandal factor – but it’s def that other guy. Umm I wouldn’t expose my life on national television for 3-5k either. He seems reasonable. That is not nearly enough money for public scrutiny. shes,holding out for more $$$$ and so is the latest baby daddy. 2. Yeah, because as long as your face is blurred out, no one will ever find out who you are, and you’ll be able to live a completely anonymous existence. If he didn’t want to the fame, he shouldn’t have slept with a famewhore, simple as that. Nah, she’s saying she’s single so they are not together. At least now we know much to Kail’s dismay he won’t be a deadbeat. Baby Lo could also just be Baby Lowry though. Kail likes the attention. And so does mystery man. Otherwise why would he have been banging her and then be in a position to father a child. It’s going to get out sooner or later. They are just enjoying the hype around it at the moment that shows the pregnancy in more of a positive light than the negative. I dunno, I get the desire for privacy, but dude probably shouldn’t have hopped into bed with a reality “star” then. Considering she did a live video on snapchat asking her fiends for baby names and when someone suggested Holden and she then said “but Chris would joke and say , I’m Holden the baby” and then the video abruptly ended, I’m pretty sure it’s safe to say he’s the dad. Plus the tweet and deletes they do to eachother are obviousl! !